It is version 6.1 or later. 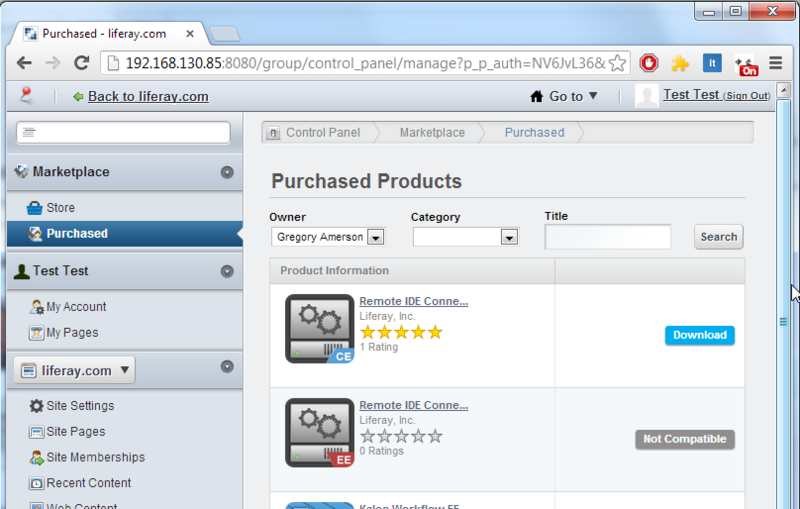 It has the Remote IDE Connector application installed from Liferay Marketplace. Remote IDE Connector contains the server-manager-web plugin that provides an API for Liferay IDE’s Remote Server Adapter to use for all its remote operations. The Remote Server Adapter lets developers deploy local projects to a remote development server for testing purposes. If you’re using Liferay IDE and want to deploy projects to a remote server, the Remote IDE Connector application must be installed on this server. Do not install the Remote IDE Connector application on a production server: it creates an unnecessary security risk. It is meant for use on development servers only. Liferay IDE from Liferay’s downloads page or download Liferay Developer Studio from the Customer Portal. Liferay Portal CE or EE, to your local development machine. Of course, we’re assuming you have a development server up and running. Our demonstration uses the Remote Server Adapter on Liferay Portal bundled with Apache Tomcat, but you can use the adapter with Liferay Portal on any application server Liferay Portal supports. You still need to install a full Liferay development environment locally on your machine before using the Remote Server Adapter, so that you can compile plugins for deployment. Follow the instructions earlier in the chapter to get your Liferay IDE or Liferay Developer Studio environment up and running. Important: Keep a record of your portal administrator login credentials (e.g., username/password) for your remote Liferay server; you’ll need them to configure your connection from Liferay IDE to the remote Liferay server. Let’s start by configuring the Remote Server Adapter. Start your remote Liferay Portal instance–verify that you can log in as an administrator. Launch Liferay IDE and open the new server wizard by clicking File → New → Other; select Server in the Server category and click Next. 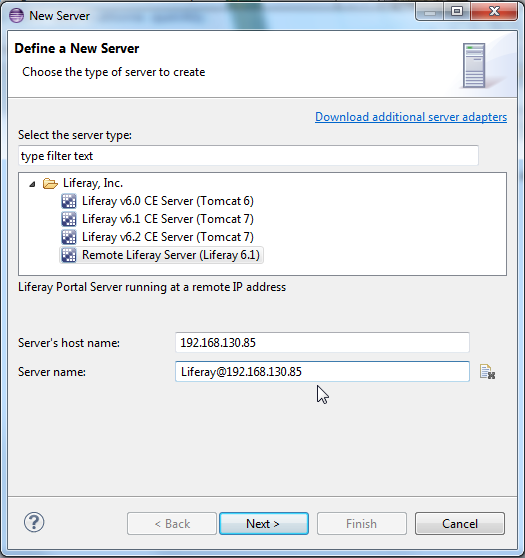 Select Remote Liferay Server (Liferay 6.1) in the Liferay, Inc. category. Enter the IP address of the machine with the remote Liferay Portal instance into the Server’s host name field. For the Server name, enter Liferay@[IP address], then click Next. Figure 10.15: Define the remote Liferay server. The New Server wizard’s next page directs you to define the Liferay Portal runtime stub. Doing so allows projects created for your remote server to use the runtime stub for satisfying JAR dependencies needed to compile various Liferay projects. Select the Liferay bundle type based on the version of your local Liferay bundle, browse to the Liferay bundle directory, and click Next. Hostname: Enter the IP address of your remote Liferay Portal instance’s machine. HTTP Port: Enter the port it runs on (default: 8080). Username and Password: Enter your administrator credentials for the remote Liferay Portal instance. Leave the Liferay Portal Context Path and Server Manager Context Path set to the defaults unless these values were changed for your remote Liferay Portal instance. Your remote Liferay Portal instance needs the Remote IDE Connector application installed; otherwise, Liferay IDE can’t connect to it. If you haven’t installed Liferay IDE Connector yet, click the Remote IDE Connector link in the wizard. If you already downloaded the Remote IDE Connector application and installed it to your remote portal, skip to the next step and validate your connection. Browse Liferay Marketplace for the Remote IDE Connector application. When you’ve found it, click Free to purchase it. Follow the on-screen prompts. Once you’ve purchased the application, navigate to the Purchased page of the Control Panel’s Marketplace interface. Figure 10.16: Click Purchased in the Marketplace section of the Control Panel to download and install the Remote IDE Connector application that you purchased. Find your application in the list of purchased products. Then click on the buttons to download and install the application. Once it’s been installed on your remote portal, return to the Remote Liferay Server configuration wizard in Liferay IDE. Click the Validate Connection button; if no warnings or errors appear. your connection works! If you get any warning or error messages in the configuration wizard, check your connection settings. Once Liferay IDE is connected to your remote Liferay Portal instance, click Finish in the Remote Liferay Server configuration wizard. After you click Finish, the new remote server appears in Liferay IDE’s Servers tab. This tab appears in the bottom left corner of the Eclipse window if you’re using the Liferay perspective. If you entered your connection settings correctly, Eclipse connects to your remote server and displays the remote Liferay Portal instance’s logs in the console. If your remote server is in debug mode, the Eclipse Java debugger is attached to the remote process automatically. You can change the remote server settings at any time. Double-click on your remote server instance in the Servers tab to open the configuration editor, where you can modify the settings. Now that your remote Liferay Portal server is configured, let’s test the remote server adapter! Once your remote Liferay Portal server is correctly configured and Liferay IDE is connected to it, you can begin publishing projects to it and using it as you would a local Liferay Portal server. Right click on the server and choose Add and Remove…. Note: Make sure you have available projects configured in Liferay IDE. If not, you’ll get an error message indicating there are no available resources to add or remove from the server. Select the Liferay projects to publish to your remote server; click Add to add them to your remote server, then click Finish. Deployment begins immediately. Your console displays a message that the plugin was successfully deployed if publication to the remote server was successful. As you make changes to your plugin project, republish them so they take effect on the remote server. To set your remote server’s publication behavior, double click your remote server in the Servers tab. You can choose to automatically publish resources after changes are made, automatically publish after a build event, or never to publish automatically. To manually invoke the publishing operation after having modified project files, right click on the server in the Servers view and select Publish. Now that you’ve seen how you can deploy projects in Liferay IDE and Liferay Developer Studio, we can begin delving into the features it offers. Next, we’ll explain Developer Studio’s Kaleo Designer for Java and how you can design workflows for enhanced business logic.